Should I Restore or Recycle? 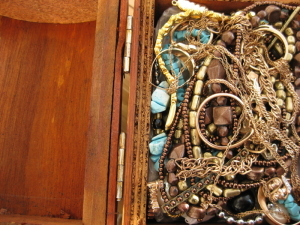 Many adults have unused jewelry pieces stashed away in jewelry boxes, drawers and safes. If you have pieces that you don’t use taking up space in your home, you might wonder if you should invest the money in having them restored to their original glory or if you should sell them to a gold buyer. While there’s no one formula to determine if you should salvage or scrap your jewelry, it helps to understand your options and weigh several different factors before you make a final decision. Old Jewelry: What Are Your Options? 1. Restore the piece to its original appearance. 2. Preserve the piece as an heirloom item for your children. 3. Sell the piece to gold buyers. If you plan on restoring a piece to its original condition, you should be aware that doing so can be very expensive. It takes a great deal of skill and experience to restore antique jewelry. However, well-restored pieces can draw significant profits on the consumer marketplace. If you plan on storing a piece as an heirloom item for your children or other relatives, consider having it professionally cleaned first. Ask your jeweler for tips on storing the piece. Make sure that all heirloom jewelry items are kept away from moist or wet areas. If you plan on selling your jewelry to a gold buyer, remember that sale prices depend on the current price of gold. The amount of money you’ll get for the jewelry also depends on the grade of gold from which it is made. Remember that you’ll receive a portion of the piece’s value. It may be worthwhile to have a piece of jewelry restored if it’s collectible and could later be resold at a profit. However, it can be difficult to decide if you should restore or recycle jewelry if it isn’t clear that you’ll make a profit from restoration. In most other cases, it’s a good idea to sell gold jewelry for a profit. After all, you can always buy a striking, new piece with the money you earn from selling your old jewelry. Selling gold should never be a hassle. For help recycling old jewelry pieces in the Buffalo, NY, area, stop by Premier Gold, Silver & Coins today.